On this DVD, you'll meet five performers who have taken this very commercial effect to even greater heights. Steve Draun is up first with not only an extremely serviceable routine, but also provides step-by-step instructions on how to make your own Ring Flight gimmick. Bruce Cervon's routine follows a very logical premise as the borrowed ring changes places with one of the keys, while Dan Tong combines another classic - the Ring On Stick - with Ring Flight to come up with a hybrid routine that is uniquely suited for the strolling performer. Dan Fleshman follows with another combined routine, using the powerful Ring Flight finish as a finale for his signature Ring and String routine, while Michael Close combines two concepts to create an effect with a borrowed ring that not only has a truly impossible ending, but one that can be performed on the largest stage. 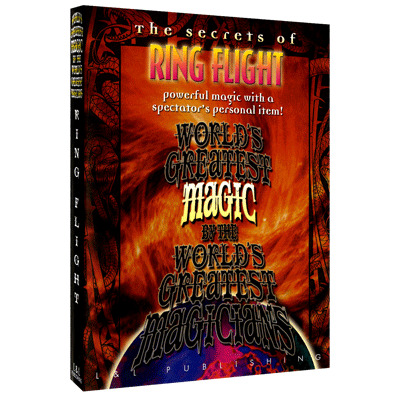 Ring Flight is truly one of magic's most commercial effects, and performers new to this effect along with magicians who are already performing a version of this trick can only benefit from the creativity and real-world advice dispensed on this DVD.